These businesses have "tools" for fishermen. 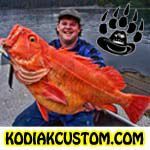 Alaska fishing tackle and fly fishing tackle shops. Fishing tackle for Alaska's salmon, trout and all other fish. Saltwater tackle, supplies, fly fishing gear, rod building materials and more. Rigid & folding shrimp & crab pots, Electra Dyne pot pullers,rope, blocks, shrimp bait, floating/sinking ropes & buoys . Proudly made in the USA. Quality gear for your Alaskan adventure. Retail and wholesale supplier of fly fishing flies for Alaska and Rocky Mountain regions. Unique and hard-to-find fly patterns. Major supplier of flies to lodges, guides and outfitters. Your S.E. Alaska flyfishing source. All the best local fly patterns. Tackle by Sage, Simms,Patagonia, Ross, Abel, and many more. Knowledgeable and friendly staff. I custom build fishing rods to the customer's specifications or needs. I can build fly, cast or spinning rods, but specialize in fly rods of all weights and sizes. Lures for salmon, halibut and rockfish. Locally owned and operated fly shop formally know as McAfee's Fly Shop.